Safco AlphaBetter 1207BE standing student desk offers a durable beige thermoplastic laminate surface. Height adjustable for added customization. Open book box and shelf provides increased storage options. Dimensions: 36" W x 24" D x 26" to 42-1/4" H.
Safco AlphaBetter 1207BE 36" W x 24" D standing student desk features a 5/8" thick medium density fiberboard (MDF) desktop in a chemical and impact resistant beige thermoplastic laminate finish. Height adjustable from 26" to 42-1/4" high in 1-1/4" increments. 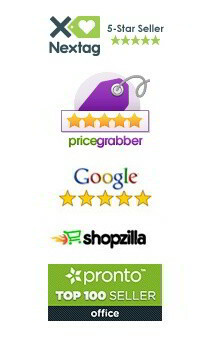 Swinging pendulum footrest bar provides ergonomic comfort. Sturdy steel base with black powder-coat finish. 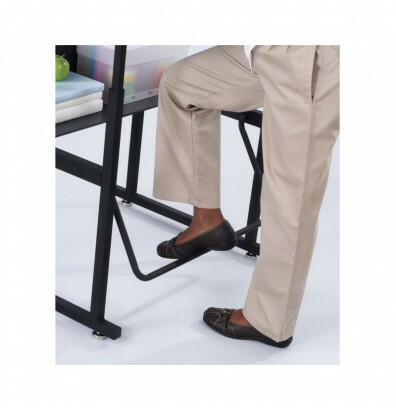 Adjustable nylon base levelers for easy movement across smooth and carpeted floors. 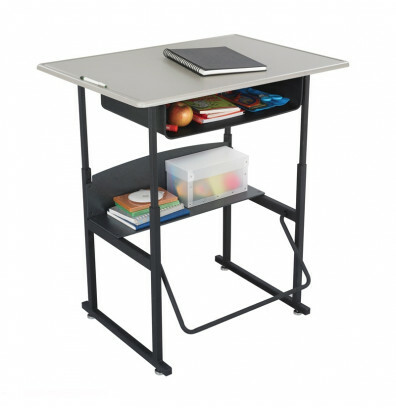 The Safco AlphaBetter stand-up student desk offers ample storage options. Includes a steel book box and open shelf for storing books, supplies, and personal items. 3-sided pencil tray on the edge of the desktop keeps items from falling off.